When questions arise about manufacturing quality gold jewelry, manufacturers are eager to talk shop with their peers and industry experts. They want to know if they are using the right alloy for a specific application, casting at the appropriate times and temperatures, and annealing properly when work hardening a piece. But refining doesn’t have to be a mystery to manufacturers. There are several methods commonly used to recover metal. Some operations are suitable for use by manufacturers and jewelers who wish to refine in-house, while others are designed for commercial refiners who handle large lots. The following are the most common methods used in the jewelry and gold refining industries. Cupellation is the technique that forms the first part of the fire assay process, in which lead is added to the unrefined gold material. The mixture is heated in air to between 1,830°F and 2,010°F (1,000°C and 1,100°C), at which point the gold-containing metal dissolves in the lead. All base metals, including the lead, are oxidized to form a lead oxide slag. A gold-silver bullion, which also contains any platinum group metals (PGMs) present, remains. If pure gold is required, additional refining steps are necessary to separate out the gold. While this procedure can be used on the very small scale (roughly up to 10 grams) such as in fire assay, its use on a small to medium scale (roughly 100 grams to 10 kg) is not recommended because it emits copious quantities of toxic lead oxide fumes. These fumes give rise to environmental pollution unless expensive fume abatement systems, also known as gas scrubbers, are installed. In the inquartation and parting process, the refinable material is melted with additional silver or copper to produce an alloy containing 25 percent or less gold. The dilution ensures that all the base metals and silver can be dissolved out in nitric acid. Next, the molten alloy should be grained to maximize surface area. The grained alloy is attacked with nitric acid to dissolve out all the base metals and silver, leaving behind a gold sludge. This sludge is then washed, filtered, and dried. Any platinum and palladium present will also be dissolved out (although the process may need to be performed twice to ensure their complete removal), but insoluble PGMs will remain. In such cases, further refining is necessary if pure gold is needed. When used for refining material that doesn’t contain PGMs, the inquartation and parting process is capable of producing gold of up to 99.99 percent purity. The process is particularly suited for treatment of low karat gold scrap, since large additions of copper or silver are unnecessary to achieve the desired 25 percent-or-less gold content. On the contrary, this process may not be as desirable for an operation making predominantly medium to high karat gold jewelry, as scraps from production may need to be substantially diluted with copper or silver. In addition, inquartation and parting can be used as a preliminary step to reduce the silver content of silver-rich refinable materials from 40 to 50 percent to below 10 percent prior to refining by the Aqua Regia process, which is explained below. A pyrometallurgical chlorination process, the Miller process is one of the oldest and most widely used processes in large scale gold refining. It involves bubbling chlorine gas through molten bullion. The base metals and silver are removed as chlorides, which either volatilize or form a molten slag on the surface of the melt. The process is complete when purple fumes of gold chloride start to form, usually when the gold content reaches a purity of 99.6 to 99.7 percent. Any PGMs present are not removed, and further refining is necessary if pure gold is required. The typical gold purity achieved by this process is 99.5 percent, with silver as the main impurity. The process has the advantage of being quick and is widely used for primary refining of gold doré from the mines. Considerable technical skills are required for this process, and there are a number of health and safety implications in the use of chlorine gas. Expensive fume extraction and treatment facilities are essential. Consequently, this process is not suited for small to medium scale refining by jewelers. An old and well-established process, the Wohlwill method is widely used in major gold refineries, often in conjunction with the Miller process. (For typical jeweler’s scraps and wastes, a preliminary refining step, such as the Miller or inquartation process, is required.) An electrolytic refining technique, it entails the electrolytic dissolution of an impure gold anode in a hydrochloric acid-based electrolyte. The process results in a deposition of 99.99 percent pure gold at the cathode. The silver and insoluble PGMs (along with a little gold) fall out as anode slimes, with the silver precipitated out as silver chloride, and all are recovered later. Any base metals, platinum, and palladium remain in solution, and can be treated later to recover the PGMs. Gold of a purity of at least 98.5 percent is normally required for the anode, as too much silver will result in silver chloride building up on the anode surface and preventing dissolution of the gold. Typically, the input material for the anode is the gold from the Miller process, described previously. Because it is time consuming-typically 24 hours or more-and suffers from the lock-up of gold inventory in the electrodes and electrolyte, the Wohlwill process is not suitable for small-scale refining. A variant of the Wohlwill electrolytic process, the Fizzer cell process is suitable for jewelers’ small-scale refining operations. In the electrolytic cell, the cathode is contained within a porous ceramic pot, which acts as a semi-permeable membrane; it prevents gold dissolved in the electrolyte on the anode side of the wall from passing through and depositing on the cathode. Thus, gold and other soluble metal chlorides build up, and insoluble chlorides, such as those of silver and the insoluble PGMs, drop to the bottom of the cell. Periodically, the cell is drained and filtered, and the gold in the electrolyte is precipitated with a selective reducing agent, as in the Aqua Regia process described later. In this way, the dissolved PGMs are separated from the gold, which can reach a purity of 99.99 percent. Unlike the Wohlwill process, the Fizzer cell can treat anodes containing up to 10 percent silver, and up to 20 percent silver if an imposed alternating current is added. The surface of the anode may need to be scraped free of silver chloride at regular intervals. The Aqua Regia process can produce gold of up to 99.99 percent purity. It is based on the fact that Aqua Regia (a mixture of hydrochloric and nitric acids in a 4.5:1 ratio) can dissolve gold into soluble gold chloride. The process is most suited to medium- to large-scale operations. A typical batch size is 4 kg of scrap, and equipment in a range of capacities is commercially available from several suppliers. The main limitation of the process is that the feed material should have a silver content of 10 percent or less to avoid blocking up the dissolution of the scrap. Because of this, pretreatment by the inquartation process to reduce the silver content may be necessary. Alternatively, the low silver content may be achieved by a judicious blending of batches of scrap. Thus, the process is more suited for medium to high karat gold scrap refining. In practice, the scrap is grained to increase surface area and treated with a series of Aqua Regia acid additions. Gentle heating speeds up dissolution. Copious brown fumes of nitrogen oxide are emitted while the gold is being dissolved. Fume abatement systems are required to stop emission of these toxic fumes and to comply with pollution laws. It is also worth noting that these strong acids require suitable storage and safety procedures. Once the gold is dissolved, the yellow-green solution must be filtered to remove the insoluble silver chloride, the insoluble PGMs, and any non-metallics, such as abrasives and inclusions. The gold can then be selectively precipitated using a number of reducing agents, such as ferrous sulphate (also known as Copperas), sodium bisulphite, and sulphur dioxide gas. Other less frequently used agents include hydrazine, formaldehyde, oxalic acid, and hydroquinone. Some emit copious quantities of gas and some are carcinogenic. After precipitation, the solution should stand overnight to allow the fine gold particles to settle as a sludge on the bottom. Most of the liquid can be decanted off and the remaining portion with the gold can be filtered. To ensure that all other metals are dissolved away, the filtrate is washed with hydrochloric acid and then water. It is then dried and placed in a crucible for melting and graining. Occasionally, jewelers who try this process complain that they have lost a considerable amount of the gold. This suggests that either they are not fully dissolving all the gold in the first stage or, more probably, not precipitating all the gold in the reducing step. To see if you are guilty of the latter, analyze the liquid for gold content using the stannous chloride test. As with some of the other refining methods, the dangers of handling strong acids are present in the Aqua Regia process. Anyone using this process must be aware of the risks and ensure that they have trained chemists and safe facilities. In fact, all of the refining processes described in this article require technical expertise and safe implementation. Each process entails permit licensing and regulation by the EPA. For all of these reasons, as well as the safety requirements described in this article, it is often safer-and more cost-effective-to leave refining to the experts. In any strategy to recover precious metals, there is no sense in spending more on processing costs than the value of metal recovered. Compare the overall cost of in-house refining to the recovery efficiency (the amount of gold and other precious metals) achieved by an outside refiner. You may find that low-grade scraps and wastes are not economic to recover in-house and are best treated by a commercial refiner. Silver and platinum group metal (PGM) recovery will also play a part in determining the economic viability of in-house processing. 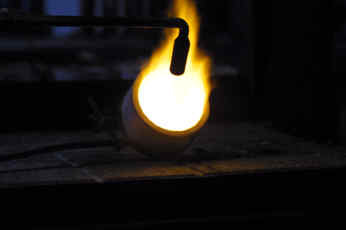 The gold purity obtained will vary depending on refining technique and operating skill. If the gold is being used for re-alloying in-house and you have access to analytical facilities to obtain gold purity, this may not be important. If you are re-using the gold for new alloy production, be aware that some impurities may not be removed in the refining process. For example, PGMs are not removed by some techniques, and they can affect the new alloy’s color or properties. It is essential to make sure that all the gold is recovered. This requires an understanding of the underlying technology and good process control. Think about health, safety, and environmental pollution. Local legislation on disposing of effluents and release of toxic fumes may restrict your choice of technique. Also, many refining techniques require the use of strong acids; the safe storage and handling of these chemicals may restrict your choice.